perhaps it’s time for the pen to say it’s farewells for regular use in the classroom, replaced by the smartphone and relegated to ‘writing time’, just like we used to have “computer time” back when I was a kid. I agree that, in classes where all the students and teachers have both a smartphone and affordable bandwidth always available, smartphones may do much more to improve learning than it usually happens in such classes. Let’s just not forget that such classes are much less common than we may think, even in so-called “first-world countries”. Because those students may have just been resourceful idiots. 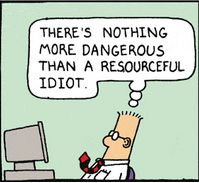 And There’s Nothing More Dangerous Than A Resourceful Idiot (Dilbert). It is probably true that the most innovative uses of new technology are much more likely to come from very young people. It is certain that very young people learn how to LOOK proficient with new technology much quicker than older people. But assuming that, by and large, “digital natives” actually understand what they are doing with ICT just because they are digital natives would be really naive. Ditto for using the default digital habits of mainstream digital natives as THE reference best practice for reforming education.